Soldiers from the Belgian army patrol in the picturesque Grand Place in Brussels, Nov. 20, 2015. The Belgian government admitted this week it had lost control of a rundown Brussels district linked to a series of terror attacks in Belgium and neighboring France, including those last Friday in Paris. But while the government has promised to “clean up” the Molenbeek neighborhood, that will be a tall order for the country’s demoralized and fractious security services. “There are several other neighborhoods and towns in Belgium exhibiting the same high levels of radicalization,” warned Roberta Bonazzi of the Counter-Extremism Project, a nonprofit policy organization. Bonazzi said the toxic mix of second- and third-generation immigrant resentment, petty criminality and jihadist activity has been allowed to fester. The committee in Belgium's parliament that oversees the security services this week launched an inquiry into intelligence and law enforcement failings leading up to the terror rampage in Paris, which left 130 dead and 352 wounded. The panel will focus on embarrassing questions, such as why Belgian security agencies didn’t monitor militants involved in the Paris attacks more rigorously, when they had already identified at least three of them as radical Islamists. It will also look into why Belgium's security services didn’t share information on them with their French counterparts. 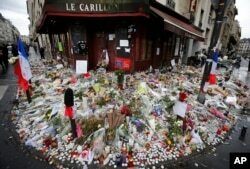 Flowers and candle tributes are placed at the Restaurant Le Carillon in Paris, Nov. 19, 2015, after last Friday's attacks. In early 2015, two of the three Abdeslam brothers involved in the Paris terror plot were questioned by Belgian authorities after one of them tried to travel to Syria. Thirty-one-year-old Ibrahim Abdeslam, the older brother who blew himself up outside the Comptoir Voltaire café in Paris and who ran a bar in Molenbeek, got as far as Turkey, but Belgian officials said they did not have sufficient grounds to hold him on his return because they had not proof he was involved in terrorism. Still, Belgian intelligence officials admitted to VOA that they were aware Ibrahim Abdeslam traveled often to Paris in the weeks preceding Friday’s attacks. Even so, they did not flag him to French counterterrorism agencies. The Belgian security services had also been monitoring Bilal Hadfi, one of the attackers at the Stade de France last Friday. A file was opened on Hadfi earlier this year after he had traveled to Syria, says a Justice Ministry spokesperson. The Belgians issued an international arrest warrant for Hadfi, but his whereabouts were unknown until last week, when he blew himself up outside the Paris stadium. In emergency meetings Friday in Brussels, interior and justice ministers from across the European Union discussed how their intelligence services can improve information sharing and better coordinate their counterterrorist operations. But many of the security missteps before the Paris attacks can be traced directly back to Belgium. And that is raising difficult questions for the Belgians -- not only about the performance of their law enforcement and intelligence agencies, but also about how they are structured and run, often along competitive rather than cooperative lines. French officials have made barbed references this week to what they see as Belgian failings. Belgium’s foreign minister, Didier Reynders, bridled at the criticism, noting in a news conference that French intelligence had been monitoring Nemmouche Mehdi, a 29-year-old French national of Algerian origin, but that he was still able to carry out a shooting at the Jewish Museum in Brussels in May 2014. But it isn’t just the French who have been scathing about how the Paris attacks were planned and plotted in Molenbeek without the knowledge of Belgium's security services. Residents of the Brussels suburb of Molenbeek are searched by police vefore taking part in a memorial gathering to honor the victims of the recent deadly Paris attacks, in Brussels, Belgium, Nov. 18, 2015. Belgian lawmakers, too, have been critical. "One must wonder why these men had not been properly monitored,” said Green lawmaker Stefaan Van Hecke. Even before Friday’s attacks, and the exposed shortcomings in Belgium's counter-terror efforts, the poor coordination between local police forces, the federal police and state security was an open secret. Just weeks ago, an outgoing security chief who oversaw an intelligence coordination body lamented publicly how intelligence information is shared and analyzed. “The first obstacle is the language barrier," said Bonazzi, of the Counter-Extremism Project. "Every public official is required to speak both Dutch and French, but this doesn’t always happen. Then you have deep rivalry and distrust between the linguistic communities, and information is not always exchanged and understood between the French-speaking and Flemish agencies,” she said. On Thursday, Belgian Prime Minister Charles Michel pledged a security crackdown and $427 million in additional funding for the security agencies. He, too, hit back at French criticism of Belgium’s counter-terror efforts. 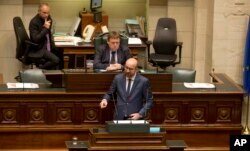 Belgian Prime Minister Charles Michel, center, addresses Belgium's parliament announcing security measures after the recent deadly Paris attacks, in Brussels, Nov. 19, 2015. ​“I don't accept the criticism seeking to disparage our security services, who do a difficult and tough job,” he told parliament. However, critics say after a gunbattle between police and jihadists in the eastern Belgian town of Verviers last January, the government announced a series of new measures and promised to recruit more state security agents, but failed to follow through on much of it. With Belgium clearly the forward staging area for Islamic State terrorism in northern Europe, the government doesn’t have the luxury of time. Bonazzi of the Counter-Extremism Project, thinks the jihadists chose Molenbeek because there are strong criminal networks there involved in drug-running and money-laundering, and because its location is so convenient.